The new World Trade Center (WTC) will build a brighter, more vibrant future for downtown New York with superior commercial space, a modernized and more convenient transportation system, and cultural and highly commemorative destinations. It will provide a significant economic boost for the area and dramatically enhance the quality of life for the people who live, work, and visit downtown. All of the projects will be built incorporating the highest standards of sustainable design and safety systems. The WTC is an unprecedented merging of architectural minds, firms, and talents, all working toward one goal: creating a grand urban center for 21st-century New York. The site will feature a collection of works by world-renowned architects - Santiago Calatrava, David Childs, Norman Foster, Frank Gehry, Fumihiko Maki, and Richard Rogers. Freedom Tower: The Freedom Tower will soar to 1,776 feet in the sky and serve as an inspirational and enduring beacon in the New York City skyline. The Tower's design evokes classic New York skyscrapers in its elegance and symmetry while also referencing the torch of the Statue of Liberty. 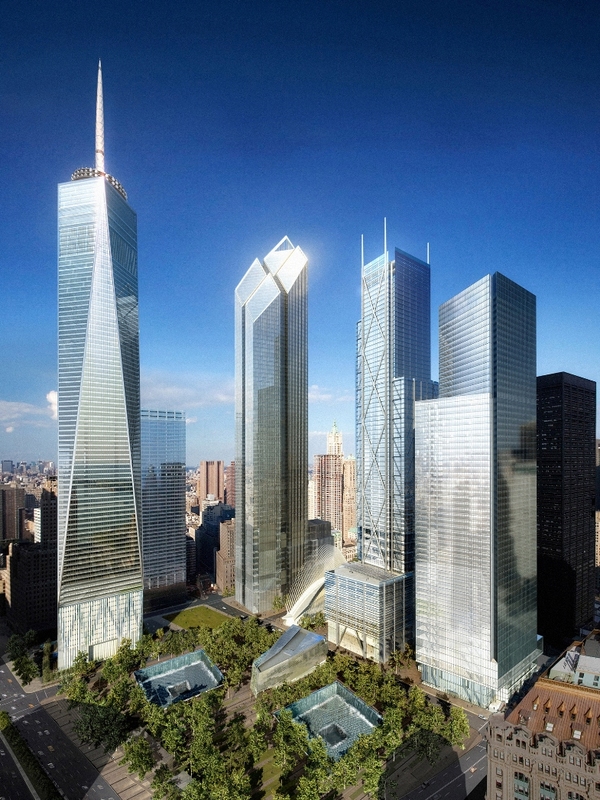 The Freedom Tower will rise to 1,362 feet, the height of the original WTC South Tower, and feature an outdoor observation deck at the height of the original North Tower. An illuminated antenna will rise from the center of the building to the symbolic height of 1,776 feet. The Freedom Tower embodies an extraordinary amount of features that will make it unprecedented in terms of life safety and security. In addition, the Freedom Tower will further its distinction as a world-class model of energy efficiency and environmental sustainability. To increase security, architect David Childs and his team shrunk the building’s base to 200 feet square, the same measurement as the original twin towers. 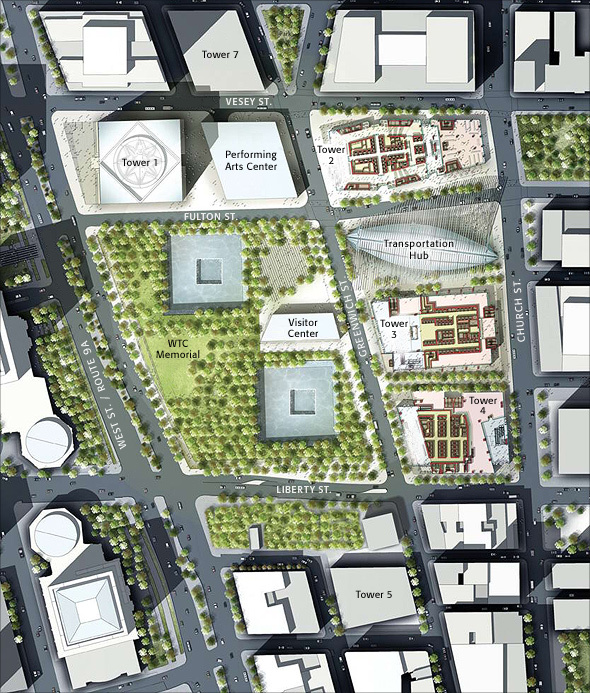 The reduced footprint draws the building back 90 feet from West Street, compared to 25 feet for the original tower design, leaving a larger public plaza and more room for at-grade security. The building will be among the country’s safest, incorporating redundant measures like a steel-frame, vertical core enveloped by two feet of solid concrete. That core will encase the elevators, stairwells, utilities, communication systems, and even an emergency “fireman’s lift.” Emergency systems will also reside in the core, such as generators, a pressurized ventilation system, and a high-capacity water storage system for building sprinklers. 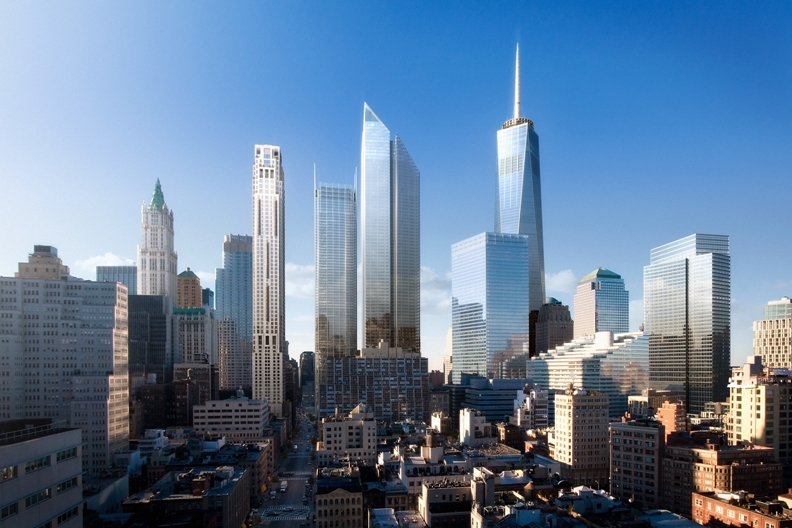 Tower Two (200 Greenwich Street): Designed by British architect Lord Norman Foster, Tower Two will rise 79 stories (1,254 feet), and stand out for its distinct cruciform core and diagonal roof that slopes toward the WTC Memorial plaza. 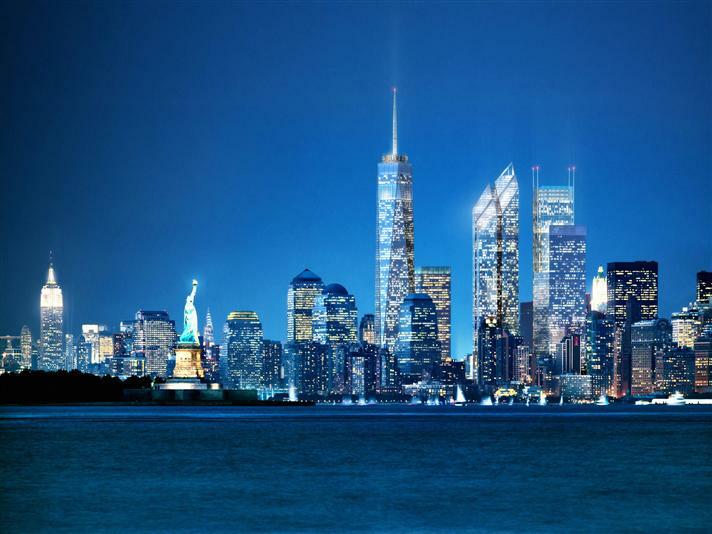 The tower will be located at 200 Greenwich Street, just east of the Freedom Tower, at the corner of Vesey Street. In total, 200 Greenwich Street will house 2.3 million square feet of office and 143,000 square feet of retail space (95,000 square feet of which is at or above street level). It will be home to 60 office floors each offering more than 36,000 square feet of space. There also will be four trading floors, 11.5 floors of building mechanicals, a sky lobby, and a 65-foot-tall entrance lobby. Tower Two appears to be made of four slim blocks that top off in diamond shapes. In fact, “notches” rise up each of the building’s four solid sides, creating the illusion of four separate mini-towers while serving to draw light into its column-free floors. The glass “roof” begins its slant upward beginning on the west side of the 59th floor, simultaneously sending morning sunlight to the memorial. The diagonal silhouette also suits WTC Master Planner Daniel Libeskind’s “wedge of light” concept, which casts no shadows on the memorial on the day of September 11th each year. Tower Three (175 Greenwich Street): Designed by Richard Rogers Partnership, 175 Greenwich Street is at the center of the various buildings around the WTC Memorial site. As a result, it stands centrally across Greenwich Street from the main axis formed by the two reflecting pools of the Memorial. The design of the tower addresses this central position and accentuates the building verticality relative to the Memorial site. As suggested in the World Trade Center Master Plan, this verticality—relative to the adjacent and smaller building at 150 Greenwich Street—is also accentuated by the stepped profile of 175 Greenwich Street and by the antennae. 175 Greenwich Street, a 71-story tower, is the third tallest building on the World Trade Center site. It will rise to 1,155 ft above street level. With 54 office floors, 175 Greenwich Street includes 2.1 million sq ft of office space and five trading floors. The footprint of a typical floor is approximately 200 ft by 198 ft. At ground floor level, the footprint of the building is 49,000 sq ft. At trading floor level—the widest level—this increases to 55,000 sq ft.
Tower 4 (150 Greenwich Street): Designed by Maki and Associates, 150 Greenwich Street, a 61-story tower, will be the fourth tallest skyscraper on the World Trade Center site at 947 ft from street level. With offices beginning at 139 ft above street level, the building will include 53 office floors that total 1.8 million sq ft. Two thirds of the office space will be occupied by the Port Authority of New York & New Jersey and City of New York, and the rest will be retained by Silverstein Properties for commercial tenants. The podium of the building consists of the ground floor as well as three additional levels above grade and two floors below grade that are dedicated for retail use - a total of 146,000 sq ft (of which 89,000 sq ft is at or above street level). The project provides access to the transportation and retail concourse below grade connected to the central PATH terminal. The tower portion accommodates office spaces in two distinctly shaped floor plates. The low and mid-rise sections on floors 7 through 44 provide a typical floor plate size of 36,350 sq ft in the shape of a parallelogram echoing the configuration of the site. These are served by three elevator banks with eight cars each. The high-rise section from floors 46 to 60 provides a floor plate size of 28,000 sq ft in the shape of a trapezoid, shaped and fluted to open toward the tip of Manhattan and triangulated from the lower floors to face the Freedom Tower. These are served by two elevator banks with eight and six cars respectively. Both office floor plans contain a central core with a 45-foot lease span on the west side facing the Memorial, 40-foot span on the north and south and a 35-foot span on the east side. The tower will also include five levels of mechanical floors. Located on the southernmost portion of the World Trade Center (WTC) site, Tower 5 will be developed by the Port Authority of New York and New Jersey. 7 World Trade Center (WTC) marks the gateway to the new WTC and heralds the spirit of redevelopment and renewal in downtown Manhattan. Opened in May 2006, the rebuilt 52-story, 1.7-million-square-foot office tower is now two-thirds leased, with a tenant directory that includes Silverstein Properties, Moody's Corporation, WestLB, Ameriprise Financial, Dutch bank ABN AMRO, and Mansueto Ventures, publisher of Fast Company and Inc. magazines. The building is developed, owned, and managed by Silverstein Properties.